Thomas Mulready of Cool Cleveland says, "My journey to the hi-end began in 2011 when they removed a tumor from inside my heart and asked me to take it easy for a few months while recuperating. I picked up a Rega P3-24 and started hanging out in record stores, stashing vinyl everywhere, hosting listening parties, joining a glam-punk band and putting together meticulously researched presentations for my new friends." 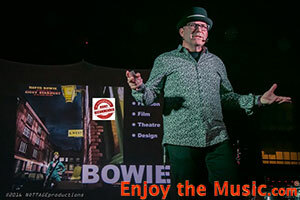 He's thrilled that Joel Davis of JD Events and the folks at AXPONA have invited him to present "An Evening With(out) David Bowie" at this year's conference at the Renaissance Schaumburg as the featured act next week on Fri 4/13. If you're planning to attend AXPONA once again, I hope you'll feel free to join us in the ballroom at 8pm, as I believe you will enjoy the show. Having attended AXPONA for the past six years, I've heard many people whine about the lack of musical diversity at hi-end audio shows, so we're doing our part to keep things interesting. As I'm sure you are aware, David Bowie's life is endlessly fascinating, and his music was always carefully produced. We've dug up a lot of rare and enlightening video, audio and photos, and we'll have some fun with trivia contests, Q&A, and even a coloring contest! 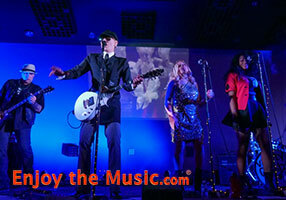 To end the evening, our band Vanity Crash will raise the roof a few inches with some Bowie favorites and period classics (Velvet Underground, Ronettes, The Zombies, Lady Gaga), along with original selections from our 2017 release Phantasmagoria, which includes a track featuring Bowie's longtime pianist Mike Garson. We look forward to seeing you there!.